Strong contrasting colors attracted us to this new addition to the Main Street series. 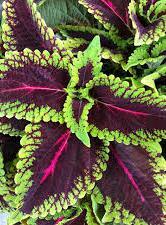 Purple centers, deep rose veining and a bright scalloped green margin. Medium height and moderate vigor make this a great combo plant.